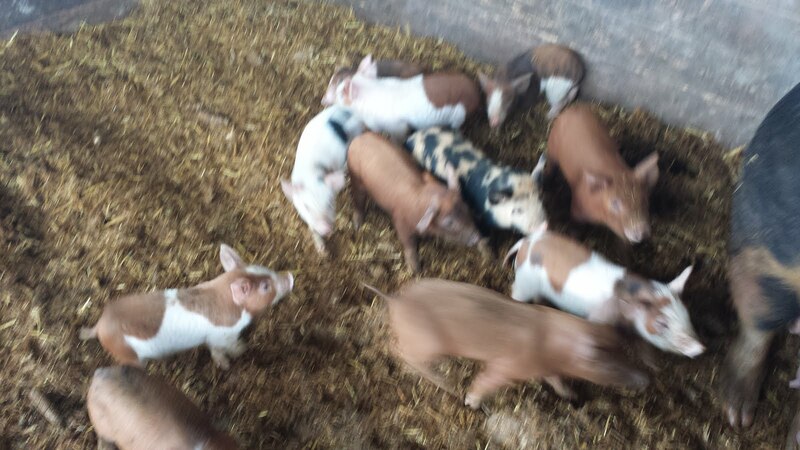 We sell pigs of all sizes, and have a variety on hand at any given time. All prices are at the farm gate or at the meat shop. We do not ship meat. Our pigs are not medicated and have access to pasture at all times. They're fed a balanced feed to supplement their forage. If you're looking for pastured pork, but want to have all the details handled, call or email us, and we'll tell you our next slaughter date. We take a $50 deposit and we'll handle the scheduling of the farm kill and have the pig delivered to the meat cutter of your choice, or we can suggest one. Once the pig is killed, we charge $2.75/lb hanging weight, less the deposit, and you pay the meat cutter his cut and wrap fee and the kill fee when you pick up the meat at the shop. The total cost for a half pig is about $350, including the cost of the pig, curing/smoking and cut-and-wrap fees. A whole pig is a little less; about $550, but these prices vary for the particular animal. We schedule our slaughter 4 times a year. If you're curious about what this process is, you can see pictures of it here. We sell suckling pigs from 4lbs (newborn) to 30lbs (just weaned). Suckling pigs are $115 + $60 kill and prep fee, and are delivered oven-ready -- hair removed, guts out, head on, packed in ice We usually have a good selection of sizes, but please do call to verify we have the size you're after. The exact weight varies based on the size of the animal desired, but the price is fixed for all suckling pigs 30lbs and under. We need 3 days leadtime for a suckling pig. You can see pictures of a typical suckling pig, oven ready, here. Whole pigs for BBQ are popular, and we sell a lot of them. The cost is $2/lb live weight + $80 for the kill, scald/scrape/gut. So a 100lb live weight will be about $280. Live weight to dressed weight (head, feet and skin on, guts out) is 75% of live weight. So a 100lb live weight pig will dress to 75lbs "on the rail" - or hanging weight. To buy a large, whole live pig, we suggest that you contact use by phone or email to see what we have in the size that you're looking for. We can discuss prices at this point; it varies, but a rule of thumb is $2.00/lb live weight. a 200lb pig would be $400. A farm visit gives you a chance the see the pig and make sure it'll fit your needs, and we'll help you load it. If you are prepared to do your own slaughter at your own location, You can slaughter on the farm, but you must start your work with sufficient time to finish it before dark; give yourself 2 to 3 hours. Customers slaughter 10 to 15 pigs a month on the farm, this is particularly popular with people who want parts of the pig that are difficult to obtain or culturally significant. You get the whole pig. You can leave any parts you do not want with us. We prefer a week leadtime if you want to slaughter on the farm. We do require the pig to be killed humanely; we will kill it for you free of charge at your request. We sell weaned pigs 20-30lbs, or feeder pigs 30-100lbs, to people who want to raise their own pork. Prices vary by season and by size of animal. Raising animals can be a great experience for kids, and there is nothing more sastisfying than having a christmas ham that you've raised yourself. I wrote up the basics in this post, but I'm always happy to answer your questions. Hanging weight is the weight of the animal, skin off, guts out, head on.